39. Sun-and-planet motion. The spur-gear to the right, called the planet-gear, is tied to the center of the other, or sun-gear, by an arm which preserves a constant distance between their centers. This was used as a substitute for the crank in a steam engine by James Watt, after the use of the crank had been patented by another party. 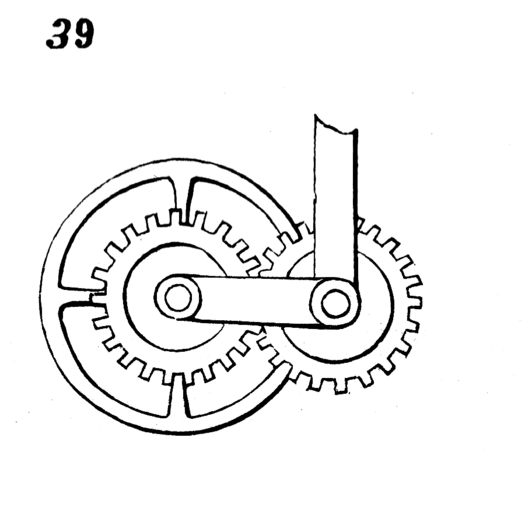 Each revolution of the planet-gear, which is rigidly attached to the connecting-rod, gives two to the sun-gear, which is keyed to the fly-wheel shaft.